As one of the world’s preeminent bell pepper lovers, I love using them in all sorts of ways. And I also happen to be pretty obsessed with samosas. So it was only a matter of time until I invented these samosa stuffed peppers, which are basically the best of both worlds! My family is Eastern European, and stuffed cabbage rolls have been a staple of our holiday celebrations for my entire sentient life. And I’ve tried not once, not twice, but three times to make a vegan version. I’ve mostly got the filling and the sauce down. But I can’t for the life of me get the cabbage as tender as my grandma does. And when you need a knife to eat a cabbage roll, it’s less than ideal. Luckily, as far as stuffed foods go, bell peppers don’t have that same challenge. You can get them perfectly crisp-tender, and cut right through them with a fork. This recipe is like a samosa that’s wrapped in a luscious pepper instead of in fried dough! As for the butternut squash, well, it adds a velvety texture and a subtle sweetness without crowding out the flavor of the potato. I kind of have to put butternut squash in everything I make right now, because they’re starting to crowd us out of our apartment. See two of them looming ominously in the background of the pictures? 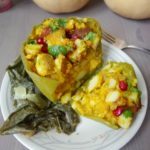 We served these samosa stuffed peppers alongside collard greens that were braised with cumin seeds, onions, and coconut milk. Nothing fancy. But the peppers can certainly stand alone, too :). As always, tweak the spices to your liking. The flavor of samosas, stuffed into bell peppers for a yummy autumn treat. Naturally vegan, gluten-free and sugar-free Indian-inspired recipe. Bring about three inches of water to a boil in a saucepan, and put all of the peppers inside (it's OK if not all of them are touching the water). Keep the water at a boil, cover the saucepan, and let the peppers cook for 5-7 minutes or until crisp-tender. Turn off the heat and remove the peppers with a slotted spoon (or VERY GENTLY with tongs), and set them somewhere to cool. Put the cubed potatoes and squash into a saucepan and add enough tap water to cover. Bring to a boil and let continue boiling for 15-20 minutes or until potatoes and squash are both soft. Drain and add to a mixing bowl. Add the rest of the ingredients except the garnishes to the mixing bowl (chopped chili peppers through salt), mashing the potatoes and squash slightly as you stir.. Taste for seasoning and adjust as needed. Use a spoon to gently scoop filling into the hollowed out, par-cooked peppers and line them up in a roasting pan. Bake the peppers for about 15 minutes or until hot all of the way through. Serve topped with cilantro, pomegranate, and chutney if using. Samosa filling adapted from Vegan Richa’s Indian Kitchen. Looking for more recipes with samosa flavors? Try these! What a great idea to stuff a pepper with a samosa style filling! This is definitely something I’ll be trying out. Thanks so much for the recipe.